This text was first published in Norsk medietidsskrift. The topic is Critical position, the genre Book review and the year of publication 2014. To cite: Nyre, Lars (2014) "A safe approach to risk. Review of Elisabeth Staksrud: Children in the Online World. Risk, Regulation, Rights", in Norsk medietidsskrift 1/2014: 93-95. The author is an associate professor at the University of Oslo, and her new book is based on the doctorate thesis that she successfully defended in 2012. Staksrud is a prolific media researcher who publishes internationally with a number of European colleagues, especially in the field of children and online media. Staksrud discusses how organized society can best protect children from online risk, and she does so by focusing on the regulations and rights that have been put in place by the EU and other supra-national institutions after the emergence of the Internet in the 1990s. She argues that the Internet has weakened traditional institutions because it was ”intentionally designed to maximize efficiency, with the least possible amount of central control” (p. 119), and she argues convincingly that this has caused problems for national legislation and regulatory schemes. Her project is to analyse this new, confusing situation with the help of Ulrich Beck’s theory of “institutionalized individualization”. The book is well structured. First, there is a theoretical chapter where she presents Beck’s theory about “Individualization”, and thereafter there are three parts of ca. 50 pages each where she deals with the concepts of ”risk”, ”regulation” and ”rights”. Staksrud supports her argument with a huge number of references to regulations and laws in the European Union and United Nation. Whether this should be called empirical data can be discussed, but it certainly helps to root her discussion in a plausible contemporary setting. Staksrud has an impressive knowledge of Ulrich Beck’s work, and she refers particularly frequently to Risk Society (1992). Her whole book can be considered an application of Beck’s theory about the increasing individualization of citizens in Northern European countries. This theory is connected to the dismantling of the welfare state from the 1980s, and also to the dominance of liberal and capitalist values in recent decades. The nation state has ever less responsibility for the risks in society while the citizens or consumers (and the companies that service them) have ever more responsibility. Staksrud argues that Beck has a blind spot by not considering children as relevant subjects, and her work seeks to rectify this oversight. Children should indeed be included in the analysis, because they ”are individuals in their own right; they can make rational (yet often risky) decisions and have the ability to act as citizens of a nation-state and human beings with human rights” (p. 155). Staksrud therefore analyses children’s online risk, and the regulations and rights associated with it, to see if recent developments can be explained with Beck’s theory. In the course of the book she ends up concluding that it can. Her contribution can be seen to be ”strengthening the theoretical claims that there has been an outsourcing of key institutions which before relieved the individual or provided him with security and orientation” (p. 171). More precisely, she shows how the task of protecting children against online risk has been outsourced from national institutions to European institutions, industry actors, and Non-Governmental Organizations (NGOs). The first part about risk is most interesting because it deals with actual child behaviour and the social surroundings of risk and coping. Risk involves commercial aspects, like harvesting of personal information by companies, or illegal downloading of copyrighted material by the child. Aggressive types of risk involve violent content, bullying and harassment, exposure to or creation of pornographic images, or grooming, and risks related to values, for example misleading information, racism, and self harm (p. 54). She specifies that there are real, assessed risks and perceived risk, and both are in principle equally important. Staksrud relates her analysis to media studies, and reminds us of media panics and the hypodermic needle theory of effect, both of which she distances herself from. However, she confirms that the media have a very important role in relation to risk. ”The mass media is, along with the scientific and legal professions, in charge of defining risks, hence they have key social and political positions” (p. 22). 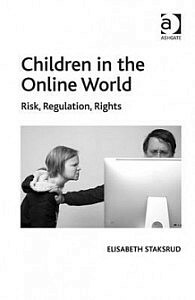 The second part deals with contemporary regulation of online risk for children, and it has an extensive review of regulatory rationales in the European Union. Staksrud identifies five such rationales or “policy pillars”: filtering and content classification, self-regulation, hotlines, awareness campaigns, and legislation (p. 85ff). These are largely promoted by private companies and non-governmental institutions like “Familie og medier”. She concludes that the European institutional approach to regulation of online risk is characterized by “a strong focus on industry-driven solutions” (p. 110). The third part deals rather descriptively with three types of rights: provision rights, that prescribe access to necessary goods, services and resources; protection rights, for example protection from neglect, abuse and exploitation, and participation rights, like the right to be respected as active member of a family, community and society (p. 146). In the EU the rights of the child are unprecedentedly strong, Staksrud concludes (p. 149). This conforms nicely to her introductory claim that children must be considered on the same level as adults when it comes to institutional individualization. It seems that this is exactly the case. Alongside the academic strengths that I have presented so far, the book also has some weaknesses. Throughout the book Staksrud has a strangely distanced relationship to the social group she describes. Children are treated mainly as subjects of regulation and rights on an international level, and there is little engagement with the way they actually think and behave. Sonia Livingstone and Elise Seip Tønnessen have written far more sensitive accounts of children’s media universe. Staksrud’s book would have become more lively if she had made use of qualitative interviews with children, or analyses of texts written by children. It also feels a little strange to exclude the school system entirely from the analysis. This huge conglomerate of institutions endeavours to increase children’s media literacy in relation to online media, and at least indirectly it reduces the risk that children are put at. Staksrud writes in a confident manner, and it feels like she is never in any doubt about her own position. There are several reasons for this impression of assertiveness. After the initial analysis of Beck’s theory she moves into a universe of bureaucratic documents where there is very little discussion of insights from other academic fields, but mainly an ever more thorough discussion of the selected documents. The book is absolutely packed with footnotes and references. Some pages only have 8-10 lines of regular text, and the rest will be taken up with detailed follow-ups and theoretical corroborations. In one case there are 61 references on only one page of text. Footnotes and references are to some extent both necessary and desirable, but this is simply too much. It makes the argument very difficult to engage with: if you keep reading without checking the footnote you feel that you are skipping things that are probably important, and if you read them all you have little chance of following the red thread. Like in a dictionary the presentation of facts and explanations trumps the readability or enjoyment of the book. If you don’t have an expert interest in the EU’s administration of children’s online risk you are unlikely to take the time and effort to hover over this complex matrix of text, references and footnotes. But I realize that readability has never been an important criterion for academic publishing, and my criticism would apply equally to countless other monographs as well. And this book is undoubtedly going to be useful for state bureaucrats in Europe, and will have a long life on their bookshelves.